Tag Archives for " nesco "
If you are a jerky enthusiast and would love to relish homemade delicious jerky at an affordable price, then Nesco FD-28JX Jerky Xpress Dehydrator Kit with Jerky Gun is exactly what you are looking for. This dehydrator comes at a reasonable price and saves you the exorbitant cost incurred from store bought dried jerky. The dehydrator is coupled along with a jerky gun with three types of tip attachments, which are a welcome addition, especially for new dehydrator users or ones who do not have sufficient prior experience of drying meat. Enhance your food drying experience with Nesco American Harvest FD-1018P 1000 Watt Food Dehydrator Kit. Dehydrating foods with Nesco American Harvest Dehydrator is a professional way of removing the moisture in fruits, vegetables, and meat to extend their shelf life. This dehydrator can make a variety of foods from fruit chips till beef jerky which is natural. There are no harmful additives or unsafe preservatives. 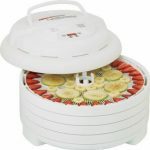 The Nesco American FD-1018P Food Dehydrator is a stackable dehydrator. It features the heating element and fan located at the bottom. This dehydrator offers a special attribute, which is the converge-a-flow drying system. This system regulates the airflow to ensure fast and consistent heat distribution. 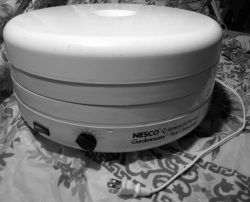 Nesco is a company which has been in the market for over 3 decades and it is known for its innovative food dehydrators. One of the leading dehydrator models in the market, the Nesco FD-75PR Snackmaster Pro Food Dehydrator is perfect for not only advanced users, but beginners as well. With over 600 watts of power, this is a dehydrator which is perfect for drying food fast. With a contemporary Vita-Save exterior made of contemporary granite, the Nesco FD-75PR Snackmaster Pro Food Dehydrator enables users to dehydrate food without losing vitamins and key nutrients. An adjustable thermostat, an expandable design and a practical drying system for even and rapid dehydrating makes this 600W food dehydrator a top performer..